How about some random B-24 goodness? An aircrew of the 455th Bombardment Group, 743rd Bomb Squadron (15th AF) standing in front of the B-24H Liberator “TePee Time Gal” at San Giovanni Airfield (Foggia), Italy, 1944-45. He -according to some sources it’s Major David G. Bellemere- is wearing a sample of typical late-WW2 clothing. Of interest are the M-2 armor vest (used by “armor-seated” crews), M-3 armor apron and M-3 flak helmet- that helmet was worn over an A-11 helmet, B-8 goggles and A-14 oxygen mask. Our friend shows his healthy individualism with those neat 1940 Pattern RAF boots. The Americans, as usual, always overkill with any kind of gear. Better safe than sorry. The 64th Squadron struck the Ring Ring coconut plantation near Gasmata, New Britain on November 24, 1943. On the way home, Henry J. Domagalski and crew, in the B-24D #42-40913, ZOMBIE, were attacked over the Dampier Strait by 12 Japanese Zeros. Flying from Port Moresby to Ring Ring on November 24th was 1/Lt. Henry J. Domagalski and his crew in their B-24 nicknamed ZOMBIE. Their mission was an armed reconnaissance to the area, with the crew running into no trouble as ZOMBIE’s bombs were unloaded over Garove Island. 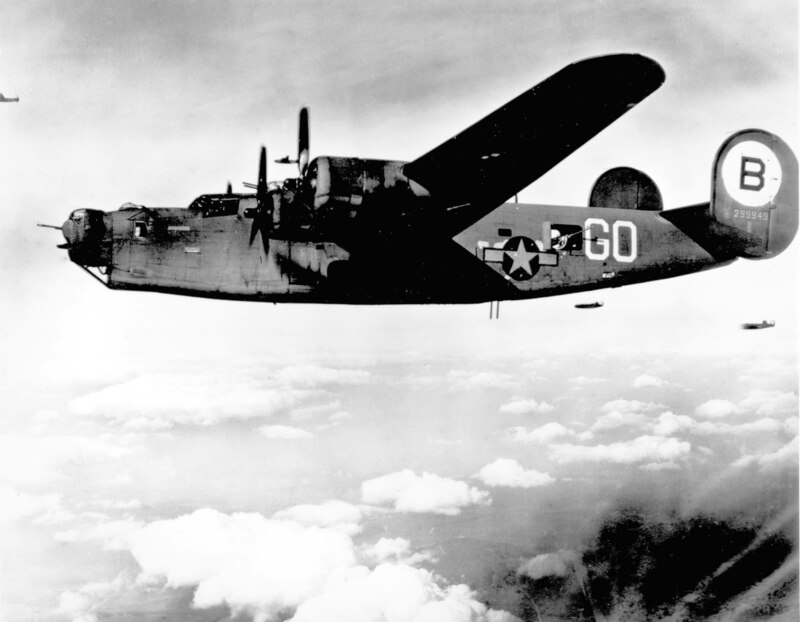 As the B-24 flew over the Dampier Strait, the crew encountered a formation of nine Japanese “Lily” bombers accompanied by 12 “Oscar” fighters returning to Wewak from a mission to Finschhafen. One of the more unusual tactics used by the Japanese against US air raids was dropping white phosphorus bombs in the midst of a bomber group. Despite the caption I don’t see a “struck down” B-24, just bursts from Willie Pete.